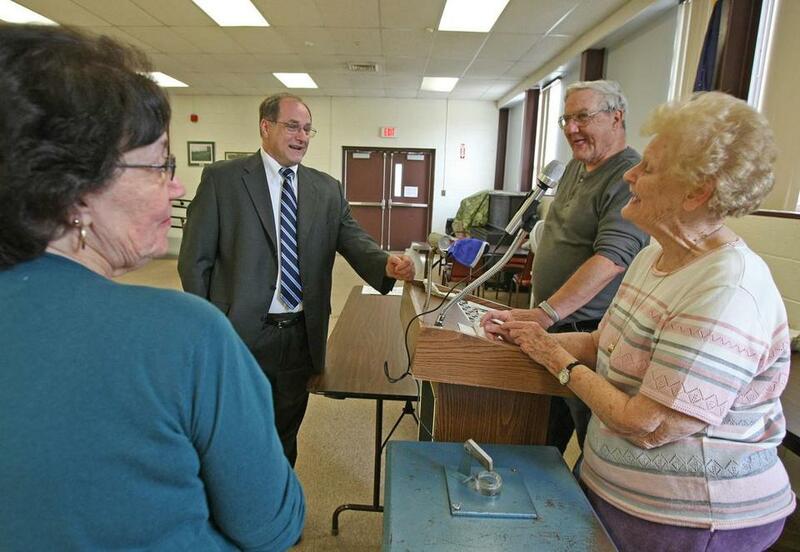 Michael E. Capuano mingled casually among the seniors gathering for bingo at Randolph’s senior center one recent afternoon. The seven-term US representative from Somerville, who is still learning his way around this new part of his congressional district, seemed to be making some good first impressions. When he is not in Washington, the 60-year-old Capuano, who has no announced opponent in this fall’s election, has been spending much of his time in Randolph and neighboring Milton, two south-suburban communities grafted onto his Boston-centered district in last year’s congressional redistricting. Capuano has toured schools and other public buildings in the two communities and met with local officials and civic leaders. He and his wife, Barbara, last month attended the Milton Foundation for Education’s gala Celebration for Education, a signature fund-raising event for the public schools. “I am trying to meet people and get a feel for the communities,’’ Capuano said. The redistricting, which goes into effect with this fall’s election, eliminated one of Massachusetts’ 10 congressional districts and reconfigured the nine that remain. All of Randolph and approximately one-third of Milton are in the new Seventh Congressional District, which also includes about 80 percent of Boston, just over half of Cambridge, and all of Everett, Chelsea, and Somerville. For the new configuration, the state Legislature’s redistricting panel performed some extra surgery on Capuano’s district to bolster its status as the state’s only “minority-majority’’ district. Removed from the district are several mostly white areas, including Boston’s North End and sections of Cambridge. Randolph is about 60 percent nonwhite. The minority population in Milton, which overall is about 75 percent white, is concentrated in the three precincts added to the new Seventh District. The nonwhite population in the district will be approximately 57 percent. A former Somerville mayor, Capuano was first elected to Congress in 1998, topping a 10-person Democratic field in a race for an open seat. In every congressional race since then, Capuano has been reelected easily. He has not faced formal opposition in the Democratic primary, and his only general election opponent was a Socialist Workers Party candidate in 2006. In 2009, he ran unsuccessfully for the US Senate in the special election to replace the late Edward M. Kennedy. At the end of 2011, Capuano had about $346,000 in his campaign treasury. Capuano said he is happy with his new district and did not ask state legislators to change any of the lines. “I just asked them to keep all of Somerville in it,’’ he said. The state has never had a nonwhite member of the US House. But David Harris Jr., a longtime Randolph civil rights activist and former Randolph School Committee member, said the reconfigured congressional district represents an important opportunity for a person of color to win the office in the future. For Milton, the redistricting split the town between the Seventh District and the Eighth District, which has been extended south into Quincy and along the coastline to Scituate. Under the current configuration, Representative Stephen F. Lynch, Democrat of South Boston, represents all of Milton, as well as Randolph. “I think it’s a positive,’’ state Representative Walter F. Timilty, a Milton Democrat, said of his town’s division into two districts. Capuano and Lynch have a history of cooperation. When Lynch came to Washington after winning a special election in 2001, he stayed on Capuano’s couch before he found an apartment. Now, with their districts about to change, Capuano said that Lynch has briefed him on issues in Milton and Randolph. According to Capuano, the big issues facing these towns - transportation, education, health care, and jobs - are the same ones confronting the other communities he represents. “It’s not like this is the other side of the moon,’’ he said.